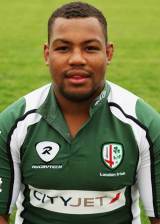 Steffon Armitage's build, stocky and with a low centre of gravity, combined with his pace make him a formidable opponent. His scavenging skills and physicality have always made him a handful on the openside but he has struggled to cement a place in the England set-up. He made a name for himself at English side London Irish and was called into the England Saxons squad for the 2008 Churchill Cup and helped them claim the title. A first call-up into the full England squad came the following year as a replacement for the injured Lewis Moody with his Test bow coming against Italy in that year's Six Nations. As a result he and fullback Delon became the first pair of brothers to figure in the same England side since Rory and Tony Underwood last took the field together during the 1995 Five Nations Championship. A graduate of the Saracens Academy, he earned two more caps against Argentina later the same year but did not add to that tally until the following year's Six Nations - when he made two appearances off the bench. Selected to tour Australia in 2010, he started the match against the Australian Barbarians in Gosford before scoring an early try against New Zealand Maori at Napier but again failed to force his way in the Test reckoning. Armitage continued to turn out for the Exiles but became increasingly frustrated at international level. At the end of the 2010-11 season, Armitage announced that he was to journey cross-Channel and link up with Toulon - a move that would jeopardise his international future given the Rugby Football Union's policy of only selecting overseas players in 'exceptional' circumstances. He thrived at Toulon, where he would later be joined by brothers Delon and Guy, and his impressive form was recognised by influential rugby newspaper Midi Olympique who named him as the Top 14 Player of the Season.